How Far is SKC Tulip? Sri Krishna Constructions (India) Pvt. Ltd., the promoters of the project are in the business of real estate development for over a decade. The group has successfully developed and launched projects in various parts of Bangalore. The core strength of the group is to deliver high quality projects at a reasonable cost thereby benefiting the consumer. SKC Tulip, is a premium apartment project in the group’s flagship project, SKC White Meadows situated at kengeri satellite town which is just off the Mysore road. 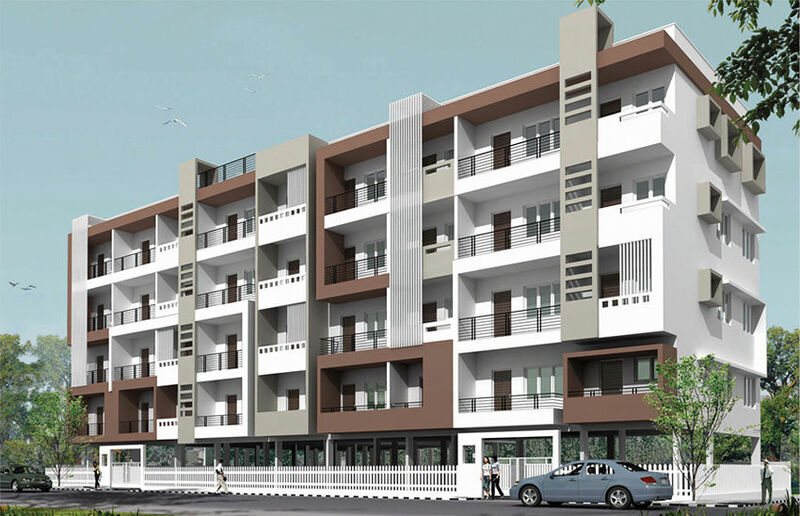 The Project is just a km away from Kengeri Ring Road, Mysore Road and Kengeri Metro Station. The Project is also adjoining to NICE Road on Mysore Road. SKC Tulip, is an BBMP approved apartment project with latest amenities and facilities that shall make you and your family proud of owning a home in the best neighborhood at Kengeri. Life’s a Fiesta, spread over acres of pride at the SKC White Meadows campus, SKC Tulip comprises of premium 2 BHK and 3 BHK Living Spaces that are 100 % vastu compliant. The campus comes with lots of open space, landscaped gardens, boulevard, water fountain, children’s park, amphitheatre, club house and swimming pool. Vitrified 2'x2' tiles flooring for the living room dining area & all Bedrooms. Antiskid ceramic tiles flooring for kitchen, bathrooms, balcony and utility. Vitrified / Natural stone flooring for common area. Granite platform with stainless steel single bowl and drain board sink. 2' Dado above platform area in ceramic glazed tiles. 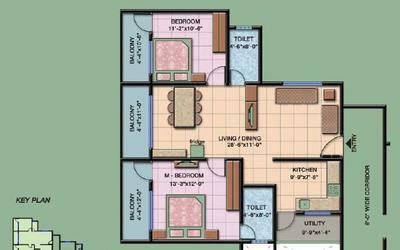 Electrical points for: exhaust fan/ water purifier / Electrical chimney & Washing machine in Utility. Ceramic glazed tiles dado up to 7 feet. Wash basin in all bathrooms. White colored sanitary ware & CP fittings. Electrical points for geyser & Exhaust fan. Powder coated Aluminum / UPVC ventilators with translucent glass. All water supply lines are of CPVC/GI B Class Pipes. Teakwood door frame with solid flush door shutter with teak veneer finish on both sides & brass/SS hardware. Hardwood door frame with flush door shutter with both side enamel paint for bedrooms, Balconies & toilets. UPVC sliding windows with glass. Interior: Emulsion paint for the entire flat on walls and distemper for ceiling. Exterior: Weather proof paint and textured paint at selective places. 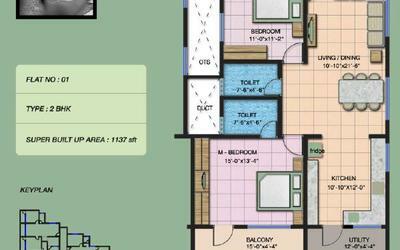 One Television & telephone points in each in Living room & Master bedroom. Power Supply of 5 KW in every 3 Bedroom flat. Power Supply of 3 KW in every 2 Bedroom flat. Stand –by generator for common areas & lift.